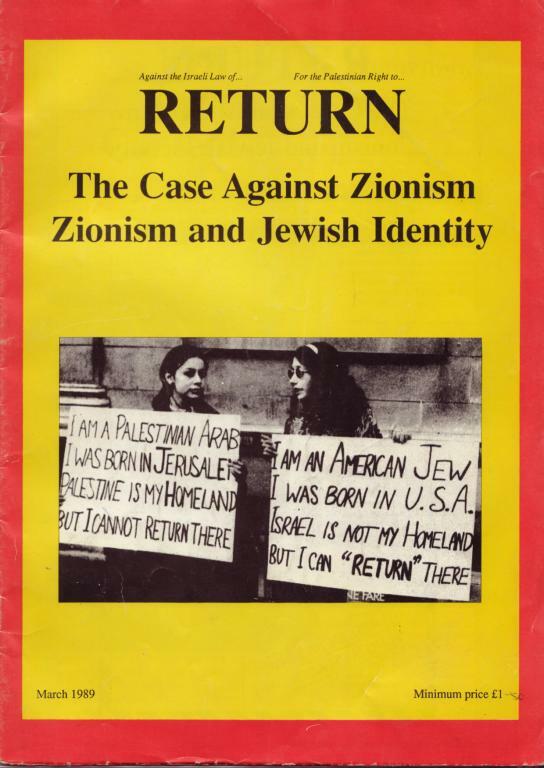 Review of the March 1989 issue of the anti-zionist magazine Return. A number of articles demonstrate quite clearly how zionism has often co-operated with, rather than confronted anti-semitism. Some zionists collaborated with the nazis before and during the second world war (both agreed that Jews didn’t belong in Europe), and more recently some zionist leaders have feted the French fascist Le Pen, who combines anti-semitism with an anti-arab and pro-Israel stance. Israel maintained friendly relations with the Argentinian Junta (1976-1983) despite widespread official anti-semitism there: of the 30,000 people ‘disappeared’ (i.e. murdered by the state) in this period, some 10% were Jews, despite Jewish people comprising no more than 1% of the total population. The group Jewish Mothers of the Disappeared responded by trying to stop the Israeli ambassador to Argentina and Itzhak Navon (ex-president of Israel) from entering the 1984 congress of Amia (Ashkenazi Jewish Council in Buenos Aires). Contributors to the magazine also examine the question of ‘Jewish identity’ in a world where the dominant definitions of this identity are based on allegiance to Israel and/or religion. In her article, Jenny Bourne is critical of the whole notion of a politics focused around the question of identity: "the question of ‘Who am I?’ has taken over from ‘What shall we do?’ as the political programme. Or rather it is substituted for politics itself". Our main criticism of Return is that most of the contributions are couched in the leftist language of ‘democratic rights’, ‘self-determination’,etc. This is particularly apparent in Return’s petition ‘Against the Israeli Law of Return, for the Palestinian Right to Return’, which among other things calls for an independent Palestinian state (presumably under the control of the P.L.O. which is described as "the sole legitimate representative of the Palestinian people"). Operating according to the same logic, a Palestinian state would suppress proletarian insurgency as ruthlessly as any other state, including Israel. For confirmation of this we need look no further than Algeria, where the F.LN., yesteryear’s national liberation movement and exemplary anti-zionists, happily massacred those staging their own local Intifada last December. We do not assert that all states are identical, or even that at certain times it wouldn’t be preferable to live under one state rather than another. It is quite understandable for instance that Jews should have wished to live anywhere else than in nazi-occupied Europe. It is not enough however to attack particular frameworks for exploitation, such as zionism or fascism. We need to attack the whole basis of these phenomena: capital and the state. As Jean Barrot has put it: "The proletariat will destroy totalitarianism only by destroying democracy and all political forms at the same time. Until then there will be a succession of 'fascist’ and ‘democratic’ regimes in time and space; dictatorial regimes transforming willy nilly into democratic regimes and vice versa; dictatorship coexisting with democracy, the one type serving as a contrast and self-justification for the other type" (FascismlAnti-Fascism).